Synthetic dye of laboratory origin resistant to high temperature. 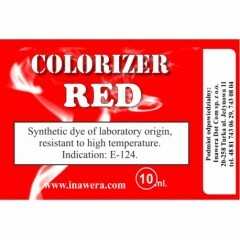 10 ml colorizer is enough to colorize 1,5 L. of your own liquid. Note: this only colours your liquid but not the vapour. Restore the colour if lost or offset due to exposure to light, temperature, air, moisture or storage conditions.